oh well.. guess it was a bit too much to expect that the DrLama aka Durama would not rear its ugly head .. but hope springs eternal as they say. Had a naughty (ok maybe not naughty) date with JoJa Dhara today. She wanted to show me around the newly opened Duran Duran regions in SL. She had been under contract with the RiversRunRed team during the build so she had to keep hush-hush but now the islands were opened and she, as I said, wanted to show me around a little and explain some of the builds. So far so good. We log in, we have each other on Skype cos my mic setup is making SL have PMS. We zoom over to the islands. We meet one old friend there .. says “hi” and then goes on our little quest. 5- 10 mins in (I’m guessing) someone .. connected to the other someone mentioned in an earlier blog …. passes us up and starts talking to us. We honestly felt like not talking to “him” but you know us (JoJa and I ) we are polite and say “hi” back. We got asked some semi probing questions (MI5 don’t call him ) and after a while he starts to get (again I’m guessing) that we just want to investigate alone and leaves. Shortly after my companion has to go AFK but says she will hang out while doing some RL work, in a sort of semi afkish state. All normal … so far. Now during our conversation its starts to heat up. My friend still in SL and still at the islands get contacted by a person that is meant to represent the band (again I’m guessing : in a professional manner) I’m not getting the specifics .. you know cos not allowed .. bad bad thing to disclose IMs) but I’m being accused … cos MY name comes up in the conversation .. not by my friend but by this so-called professional that is attacking me behind my back ..(Note: I’m nowhere near the islands .. I’m NOT logged in and I’m certainly not in contact with this person at all). So what is the reason that I sit here, in the middle of the night, two hours from when I have to get up and get my son to school? Now I assumed that when they started spamming us with the news that the day was finally here .. yada yada blah blah … and we got notes that because we were such devoted fans and loyal and had flowers up our butts (ok made the last one up 😉 ) we would get an early access pass to the islands. Yes well let me introduce you to some pictures at this point. The important thing is to note the numbers underlined in red in the pictures …. Note where it says: Everyone – 716 Members? 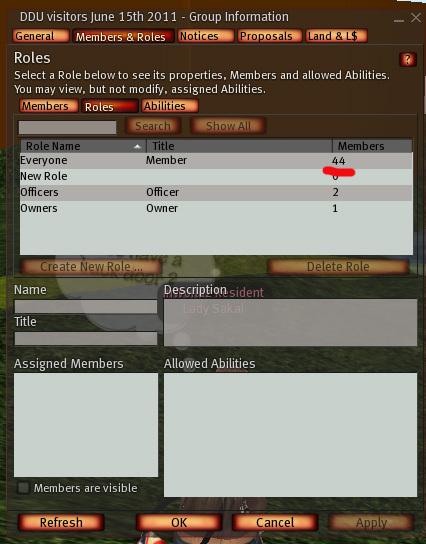 Note that is in this group , the special access group, it says 44 members? Now .. does this mean that there are only 44 Really Loyal and Devoted fans from the official fan group? I know of at least one girl that was not invited to this “special devotee group” and by result couldn’t get in today. I also knows why this girl wasnt invited in, I know she got the spam and the notecards stating that you need a special invite to get in to the islands today. So why didn’t this girl get the invite? Simple fact. Her husband had ticked the “Professional” umm.. lets call her manager .. off some years back … now that is a big NO NO. The uninvited girls husband is also on the ban list of the region (he didn’t appear on the land ban so I’m guessing he’s on the region ban list. He was placed there before the islands ever opened. Sometime last year. 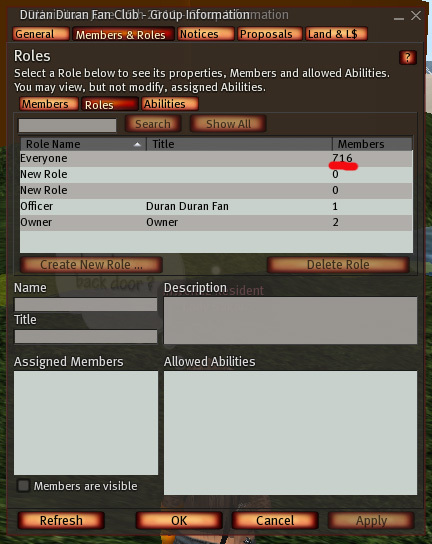 ← Duran Duran Universe in Second Life ? ?